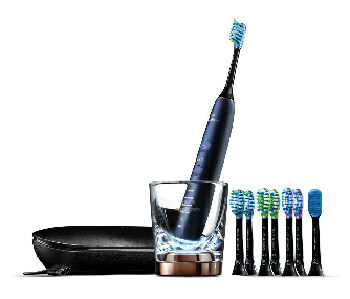 The Sonicare DiamondClean Series is the flagship line of electric toothbrushes made by Philips. 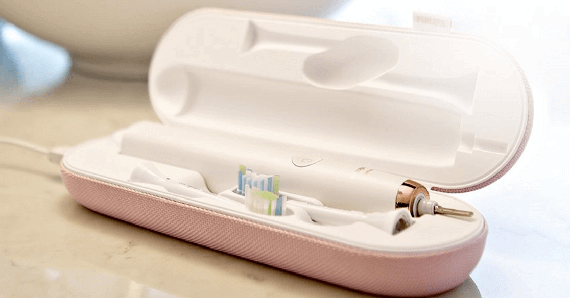 They’re packed with the latest features such as Bluetooth, BrushSync, BrushPacer, and Smart Sensors that detect your brushing habits and display them on a phone app. The Smartimer, a 2-minute timing feature, is on all models in its original form. However, the Quadpacer has been swapped in favor of the BrushPacer on the DiamondClean Smart models, which is just a different timing setup. The Quadpacer, which is still used on the standard DiamondClean models, prompts you to switch to 4 different areas of your mouth during the 2-minute brushing session. The BrushPacer prompts you to switch to 6 different areas, which means every 20 seconds the brush will vibrate differently and briefly pause. This is likely to help reduce missed areas and help make sure the app can more accurately tell where you are currently brushing. The DiamondClean standard models do not have any Bluetooth capabilities and are more similar to the FlexCare Plus or FlexCare Platinum regarding features. For many people, the phone app is not something that’s desirable and adds quite a bit to the cost. If you don’t think you’ll pull your phone out and fire up the app everytime you brush, then it may not be for you. The app does have habit tracking features that the brush will upload even if you don’t turn it on while you’re brushing. For the DiamondClean Series, the only models that have several intensity settings available in each mode are the DiamondClean Smart. If you want to avoid the Bluetooth/App feature, while still getting various intensity options, then check out the Sonicare FlexCare Platinum and Sonicare ProtectiveClean 6100 model. You do get the Sensitive setting on all DiamondClean models, which is a reduction in speed, but the DiamondClean Smart get up 3 different intensity settings available in each mode. The difference here is that you can’t change the intensity on all the modes, you can only switch to the Sensitive mode if you find the others to be too rough. If you’re worried about the intensity of the brush, another thing to keep in mind is the Easy-Start feature. 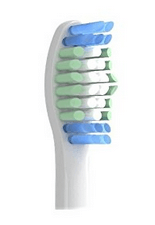 When you first use a Sonicare brush it has a reduced intensity for the first 12 to 14 uses. As you use the brush after each session lasting at least 1 minute, you advance through the Easy-Start stages, and the intensity is slightly increased. You have to brush for at least 1 minute to progress through it. This is meant to help you get accustomed to an electric toothbrush. So, what are these fancy features available on the app? Here’s a brief overview and we’ll go into more detail in the App section below. The BrushSync and Smart Sensors are the key features that go along with the app. BrushSync isn’t 100% dependent on the app. However, the Smart Sensors require you to use the app to get any value from them. BrushSync is a feature that syncs a brush head to the handle so that it can track how often you use it and tell you when it needs to be changed. There is also a light on the handle which will alert you to change the brush head. This feature only works this way for “Smart” brush heads and not the standard models. In addition to the usage tracking, when you attach the Smart brush head it will automatically select the brush mode intended for that brush head. The Smart Sensors are where the app tries to determine where exactly in your mouth you are brushing and tracks how closely you brush to the “ideal” routine. Ideal meaning you spend the right amount of time in each section of your mouth and not missing anything. It will also suggest areas you might need to touch up after the 2-minute brushing time has finished. However, if there was some mistake in the tracking, it will incorrectly suggest an area to brush. There is a brushing calendar, which shows how often you brushed over the last month. This feature works well. Reviews of the app are not excellent, both on retail sites as well as the iOS and Android app stores. We’re skeptical of how useful this is in producing real results for improved dental health. As you can see, there are a few colors to pick from for each series and you get great accessories like the Premium Travel Case, Charging Travel Case, Glass Charger, and Compact Charger. We go into detail about features and accessories in the table below. Aside from the Bluetooth and Phone App features, the DiamondClean and DiamondClean Smart models are nearly identical. The only significant differences being the slightly reduced battery life with the DiamondClean Smart models, likely due to the Bluetooth feature, and BrushPacer instead of the Quadpacer. You get about 3 weeks of battery life with the DiamondClean and 2 weeks with the DiamondClean Smart. It’s not a big deal as that’s plenty of time to get around to charging it. One other different you should take note of is the brush heads. As we mentioned above, the DiamondClean Smart models use “Smart” brush heads which work with the BrushSync feature to track usage. You don’t have to buy Smart brush heads as replacements if you don’t feel the need, but keep in mind that they are different. Except for the DiamondClean Smart 9700 model, the rest of the DiamondClean Series has a variety of color options available if you don’t like what we’ve shown in the table. The intensity settings are exclusively on the DiamondClean Smart models, but you do get different modes on the DiamondClean. Some people like to be able to lower the intensity if your teeth happen to be sensitive that day, so having that extra convenience is excellent. For accessories, a majority of the models come with the Travel Case and Glass Charging Base. The USB Travel Charger, with the HX9392/05 model, is super convenient and allows you to leave the brush inside the case as it charges. The other models do not come with the Charging Travel Case, but rather a case that looks just like it without the charging abilities. The core features, such as speed, Smartimer, Pacer, Battery Type, and Brush Head Compatibility are the same or very similar for all the DiamondClean models. Philips has moved the entire Sonicare series to the 62,000 “brush movements” per minute speed specification. This is essentially just marketing, as they have always listed the brush strokes per minute and now have doubled the number by calling it “brush movements.” So when you see 31,000 strokes per minute on some specifications keep in mind that it’s the same as the 62,000 brush movements per minute. They didn’t double the speed. We mentioned earlier that there isn’t a way to change the intensity of some of the DiamondClean brushes, but the brush modes do have some differences. Clean Mode: You get the full 31,000 strokes per minute speed and is the base setting for every Sonicare toothbrush. White Mode: After the 2-minute timer you get an extra 30 seconds to focus on your front teeth (or anywhere). Philips also says the brush “works a bit harder” but doesn’t provide any numbers about a speed increase. Gum Health Mode: Adds an extra minute to the end of the 2-minute timer. Sensitive Mode: This gives a reduction in intensity. Deep Clean Mode: This is a 3-minute brush timer that is more powerful than any other mode. We’re not sure what the difference is in terms of strokes per minute. Below are some screenshots from the introduction to the app. This covers most of the features you’ll see with the DiamondClean Smart toothbrushes. While the BrushSync feature is available on both FlexCare Connected and DiamondClean Smart, the DiamondClean will switch to different brush modes automatically depending on which Smart brush head you attach. Also, the non-Smart brush heads aren’t able to be tracked by the app in the same level of detail as the Smart versions. What does that mean exactly? Well, the Smart brushes can be tracked individually even if you swap to a different brush head between brushings. The handle will not know which brush head you have attached to it or if you’ve changed the brush head at some point, it just keeps a 3-month timer that you have to manually tell when you’ve changed the brush head. In other words, there’s no unique identifier to the non-Smart brush heads, so the app can’t know any specific information about them. First off, the focus areas feature lets you identify areas of your mouth that need particular attention. For example, if you have a lot of plaque buildup in an area, you can select it, and your brushing routine will prompt you to spend more time there. The location detection is somewhat sketchy and unreliable, but you have to make sure to start in the correct area or else it will throw the whole thing off. It does seem to have issues keeping this 100% accurate, which is frustrating if you wanted to like the app. The good news is they are probably updating the app as they improve their algorithm, so you’re not stuck with a static product. The pressure sensor works just fine without using the app, but this gives you another way to visualize the amount of pressure your using. The monthly overview is one way to hold yourself accountable to brushing twice daily and going for the full 2 minutes. Lastly, possibly the most helpful part of the app is tracking how often you need to change the brush head. It’s easy to forget, and if you just log in to the app to do this, it will probably be worth it. Remember, if you aren’t using a Smart brush head, then you have to let it know when you change the brush head manually. Some people report having issues with the app tracking their brush location accurately, which isn’t surprising. We think the app is unnecessary for improving your dental health and is challenging to make use of it consistently. It just comes down to not wanting to pull out your phone and fire up the app when you’re just trying to get ready to work or go to bed. Q: Is it safe to leave the toothbrush on the charger all the time? A: It is never a good idea to leave electronics plugged in after they’re fully charged as not all chargers are sophisticated enough not to damage the battery. Try to plan to charge it every week or two. Q: Are Sonicare DiamondClean toothbrushes dual voltage for international 220V outlets? Q: Is it safe to use a Sonicare DiamondClean in the shower? A: Some people have no issues, but there are reports of failed units due to water leaking into them. It’s best to be cautious and not try this. Q: Can the Sonicare DiamondClean brushes be used with braces? A: It’s always a good idea to check with your dentist or orthodontist, but in general it’s okay to use an electric toothbrush with braces. Water flossers are also an excellent option for keeping your teeth and braces clean. Q: How often do you replace the brush heads? A: Philips recommends every 3 months, but you may be able to go longer. If your brush becomes frayed, it won’t brush properly, and then you know you need to change it. The BrushSync feature will take care of alerting you when it needs to be replaced, but it’s up to you to decide what to do. Q: Is there supposed to be a gap between the brush and the handle? A: This is completely normal and intended. This lets the brush vibrate properly and produce the movements that it’s designed to do. Adjusts to the contours of your teeth for more surface contact. Specializes in reducing Gum inflammation. Removes 10x more plaque than a manual toothbrush. Cleans between tongue grooves to reach bacteria below the surface. Removes 7x more plaque than a manual toothbrush. Specialized in cleaning between teeth and for patient with increased risk of periodontal disease. Remember, the Smart brush heads are used with the models that include BrushSync. You’ll want to get the Non-Smart replacement brush heads below if you’re buying the standard DiamondClean brush handle. There’s no difference between the brush heads with the same name other than that the app can track the Smart brush heads. This is a basic brush head that Philips claims removes 2x as much plaque as a manual toothbrush. Removes 6x as much plaque as a manual toothbrush. Primarily designed for plaque removal. Removed 6x as much plaque as a manual toothbrush. Gentle on gums. Removes 7x as much plaque as a manual toothbrush. Primarily for interdental cleaning. Removes 7x as much plaque as a manual toothbrush. Primarily for stain removal. Removes 10x as much plaque as a manual toothbrush. Primarily for deep cleaning and is gentle on gums. All DiamondClean models come with lithium-ion batteries, which are much better performance than NiMH found in some other models. As always, we recommend you don’t leave your toothbrush plugged in after it has been charged. Leaving it plugged in can damage the battery, and it’s best to be cautious. There are a few reports of people having their units stop charging, and one possible explanation is that they always left their brush sitting on the charger. Keep in mind, you do get a 2-year warranty and can get a replacement if there is some defect or failure that happens during that period. The area between the brush head and handle should be kept clean, but don’t poke at the seal as you might damage it. It’s a good idea to remove the brush head and let this area dry out after brushing. You don’t have to do it every time, but keeping the area dry also helps keep it clean. Your primary concern should be keeping your brushes and handle clean. None of the DiamondClean models come with the UV Sanitizer, but regardless you should clean your brushes with isopropyl alcohol or hydrogen peroxide at least every few weeks; more often the better. The Sonicare DiamondClean models are extremely friendly for international travelers and are compatible with 110-220V power outlets. You will need an adapter for your outlet if you are traveling outside North America. We recommend choosing a model with the Charging Travel Case. It’s very convenient and compact. 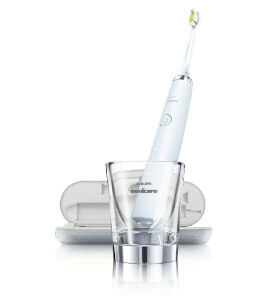 The Sonicare DiamondClean Series is packed with features that extend from the Bluetooth capability and phone app. It’s not necessary for you to use the phone app to get a great experience. You can always just brush your teeth and go with your life. The brushing calendar feature is a convenient way to see how often you brush and maybe give you some motivation to improve. The location tracking features work reasonably well, but we find them to be unnecessary. If you’re looking for more simplicity and still retain much of the basic features of the DiamondClean Series, then check out our review of the ProtectiveClean brushes. Still not sure what Sonicare is right for you? Check out our comparison of all the different Sonicare toothbrushes available.